There may be times when you need to remove a radiator either permanently or temporarily. 1 Make sure you have your heating turned off. 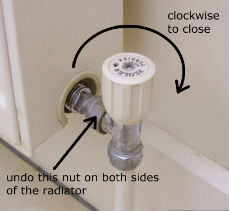 2 Make sure you turn off the isolating valves on BOTH sides of the radiator. N.B. clockwise is off . This shuts off the supply of water to the radiator from your heating system. 3 Using an adjustable spanner or maybe a footprint wrench undo the nut which sits horizontally on the radiator valve. Do not touch the lower nut which attaches to the vertical pipe. If you loosen that one off it will drain all the water out of your heating system. When you loosen off the two nuts water will start to come out of the joint. This is water from the radiator only. It can be a little messy and you will need to have a shallow container to catch as much as you can and maybe and old towel to mop up any excess. If your floor is carpeted it is a good idea to tape plastic sheeting over the floor area and around the heating pipes coming out of the floor before you begin. If you do it quick then tip the radiator into a bucket to get the rest of the water out.